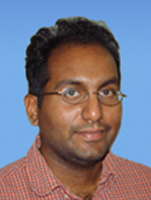 Mr. Mahavisno has eight years of experience working as a Software Developer for the University of Michigan. He has worked in various departments of the university over the years including Pathology, MICHR and worked on projects such as Pathview, Oncomine, Molecular Concept Maps. Mr. Mahavisno currently works for the National Center for Integrated Biomedical Informatics (NCIBI) developing web applications, designing and prototyping interfaces, developing data and database infrastructure. His current projects include ConceptGen, MiMI NetBrowser and BioSearch2D.